* Article originally published December 2011 by Chris Dawson MPHA (Qld). 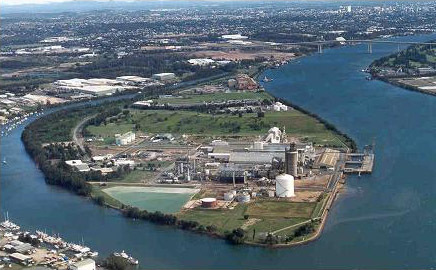 Gibson Island, on the Brisbane River near Murrarie, as it looks now. The Gateway Bridge can be seen in the background. Bubonic Plague, or the 'Black Death', is something more usually associated with the Middle Ages but outbreaks of plague, spread by rats and introduced by ships from overseas, were common in Queensland at the turn of the 20th century. The first case during that period was on Hawthorne Street, Woolloongabba, in April 1900. Over the next ten years there were 499 cases of bubonic plague officially reported in Queensland, resulting in 219 deaths, many of these in Brisbane. 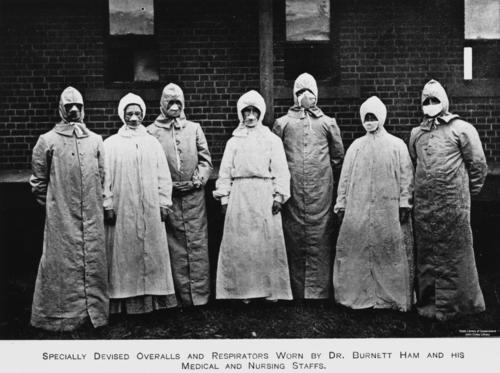 The outbreaks led medical authorities to implement strict public health and sanitary measures. Plague-affected houses were quarantined, cleaned and fumigated, bed linen and curtains burned, and an iron stockade was erected around the property and two neighbouring houses. 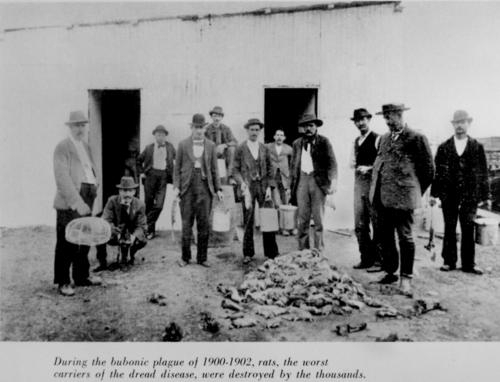 Rat-catching teams went to work, and over 90,000 rats were destroyed. Precautions also extended to the care and burial of victims. During the 1900 outbreak, plague victims were often sent to Cairncross House, the quarantine station on the riverbank at Colmslie. In May 1900 the highest spot on Gibson Island was selected as an isolated burial ground for those who died. The bodies, wrapped in sheets soaked in carbolic acid and placed in lime-slaked coffins, were transported on a special ‘plague boat’ and accompanied by only two warders and a doctor from the quarantine station, who was specially authorised to read the funeral service. The first burial, that of 18-year-old Richard Shanahan, took place in May 1900. Family members often wanted to make other arrangements, and in July 1900 there was an emotional scene at the North Quay wharf when the mother of 15-year-old victim David Fihelly 'strongly objected' to him being taken to Gibson Island. The authorities finally consented to her wishes and interred the boy at Toowong instead. At least 14 people were buried at Gibson Island during 1900, but in April 1901 a decision was taken to cease the practice on the grounds that it was 'cruel and unneccesary' and 'bitterly resented by relatives of the victims'. The funerals were also felt to take the medical officer away from the quarantine station for too long. Families were now able to make their own arrangements, but only after the bodies had been carefully coffined by Health Board officials. After this time plague victims were buried in different Brisbane cemeteries, including at least three people in South Brisbane Cemetery. After 1909 there were 12 plague-free years in Queensland, and after an 1921 outbreak that caused 63 deaths, the last reported case of plague in the State was in 1922. For such a relatively unknown part of Brisbane, Gibson Island actually has a surprising history. The island was originally known to the locals as Brophy (not Brophe, as is often stated) Island after a hermit farmer who lived there. It was also known as 'One Man Island' for the same reason. By the late 1880s it was known as Gibson's Island, after an engineer who was in charge of dredging the river. Aquarium Passage, the waterway on the southern side of the island, was so named because an aquarium opened there in 1889. In addition to the aquarium there was a 'dance hall, a zoo, a roller coaster, and a cycle track'. The aquarium was washed away in the big river flood of 1893, although most of the zoo animals were saved. It fell into decline after this, but after the world wars Gibson Island became something of a resort again. The Friend family opened a kiosk on the island in 1919 when the island was all bush, and the beaches attracted many Brisbanites every weekend. 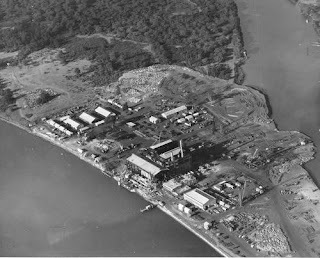 By the 1920s a popular sports recreation ground had been developed, but a power station opened on the island in the 1950s. It is likely that the construction projects on the island have destroyed any remains of the plague burial ground. P.S. A few years back I heard speculation that the bodies at Boggo Road might have been plague victims, but anybody thought to have the plague would not have been kept in a crowded prison, given the potential for an epidemic to break out.